A few posts ago I made some maps that showed how school voucher programs around the nation invariably result in tax dollars overwhelmingly flowing to religious schools; specifically, Catholic and other Christian schools. Remember that our incoming Secretary of Education, Betsy DeVos, has championed vouchers because they will, in her own words, lead to "greater Kingdom gain." In other words: voucher programs, by design, exist to support religious instruction. Voucher supporters will claim that the Supreme Court's decision in Zelman v Simmons-Harris settled the constitutionality of vouchers back in 2002. But any fair reading of the majority's decision shows they predicated their argument on the idea that families were being given a "choice" to attend either religious or non-sectarian schools; therefore, voucher programs are facially neutral and not in violation of the First Amendment's establishment clause. As David Souter points out in his dissent, however, the "choice" given to families isn't really a choice at all; it has the formal appearance of a "choice," but in reality, voucher programs give parents the "choice" of sending their children to a segregated, underfunded public school or a school that forces children to engage in religious practices. That's hardly neutral. 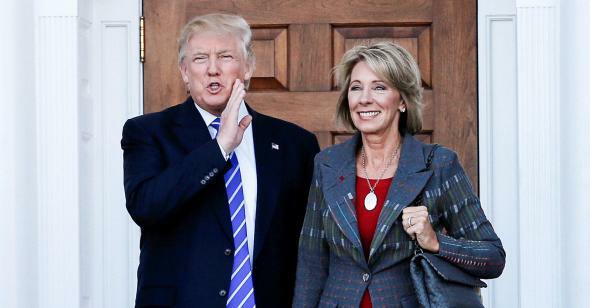 If we take DeVos at her word -- that she supports vouchers because, at least in part, they lead to "Kingdom gain" -- it's clear that any program that moves taxpayer funds to private, religious schools fails all three prongs of the Lemon Test. That's particularly true if there are other remedies the government could undertake to improve its public schools (more on this in a future post). I thought it would be interesting to zoom in a little more on some of large cities where voucher schemes have been established to see just what kind of a "choice" families who enter the programs really have. You can find links to my data sources at the earlier post. 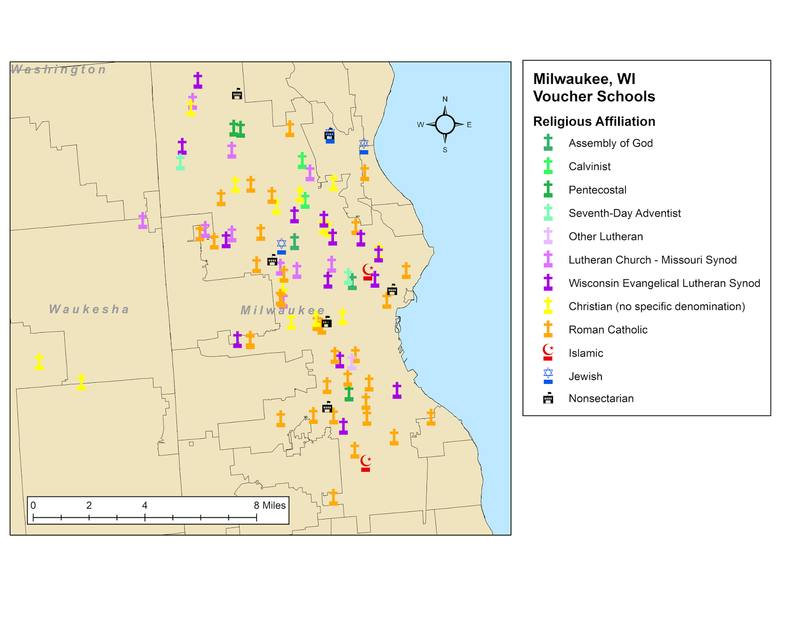 Let's start with Milwaukee, Wisconsin, which runs one of the oldest and most expansive school voucher programs in the nation (click to enlarge). Two religions dominate the program: Roman Catholic and Lutheran. There are scant few "choices" for non-Christians, and only a few schools that are non-sectarian. Of course, it makes sense that there would be many Lutheran schools in the area, given its ethnic background and history. But where are the "choices" for the families who would rather not have their children receive religious instruction? And doesn't the dominance of two particular forms of Christianity suggest the program really is advantaging certain sects over others? Again, Catholic schools predominate, but other sects of Christianity have a significant presence, and many others are not represented at all. 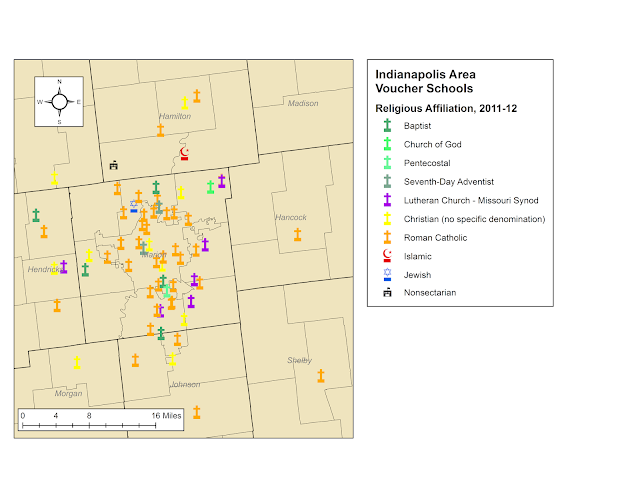 Further, there isn't one nonsectarian school inside Marion County. I speculated last time that many of the families using vouchers might choose to send their children to religious schools even without the extra taxpayer funds. In Indiana, a family of four can make up to $89,910 and still qualify for a voucher. And according to an IN-DOE report, 52% of students receiving a private school voucher had no record of ever attending an Indiana public school (p. 16). First: Students receiving vouchers are putting fiscal pressure on the system that wouldn't be there if vouchers didn't exist. In other words: their families and/or their churches would be paying for the voucher students' schooling even if they couldn't use vouchers. 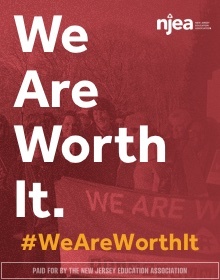 Even if you think vouchers are a swell idea and constitutional, you should acknowledge that the presence of these students requires more funds to be added to the system if per pupil revenues are to remain constant. Second: While theoretically these families are "choosing" their schools, in reality they've already made their "choice" -- and the taxpayers are subsidizing their children's religious instruction. The Effect Prong of the Lemon Test, therefore, fails: these families are receiving taxpayer-supported religious instruction for their students that they and/or their churches would otherwise be paying for. If the Trump/Pence/DeVos voucher plan passes -- and given this Congress, I have little doubt it will in some form -- the practical effect will be billions of dollars in public funds diverted away from public schools and toward private, Christian schools with the purpose of funding religious instruction in certain specific sects. I don't care what the Court ruled in Zelman -- this is, on its face, a clear violation of the Establishment Clause. Again: DeVos has publicly admitted this. I don't for a second think that will at all hold up her nomination, or will stop this voucher scheme from going through, or will keep the new Trump-Roberts Court from continuing to find vouchers constitutional. But, at the very least, she should be made to admit what she's up to. She should have to acknowledge the practical effects of school vouchers. * It's worth noting the Zelman vote by the SCOTUS was 5-4, but the Lemon decision was 8-1. Indiana's choice law prohibits the state from regulating the curriculum of schools getting vouchers, so millions of dollars of the state education budget are subsidizing schools whose curricula teaches creationism and the stories and parables in the Bible as literal truth. Among the more popular textbooks are some from Bob Jones University that are known for teaching that humans and dinosaurs existed on the Earth at the same time and that dragons were real. BJU textbooks have also promoted a positive view of the KKK, writing in one book, "the Klan in some areas of the country tried to be a means of reform, fighting the decline in morality and using the symbol of the cross to target bootleggers, wife beaters and immoral movies." The Indiana Christian Academy uses curricula from both Bob Jones and A Beka while Kingsway Christian School in Avon, Indiana, spends some of its taxpayer money to take kids on field trips to the Creation Museum in Kentucky, where they can learn how dinosaur bones prove the truth of Noah's Ark and the Great Flood. Teaching creationism as fact in public or charter schools is illegal because of First Amendment prohibitions on the government advocating religion, but there's nothing stopping schools funded with public vouchers from doing it.